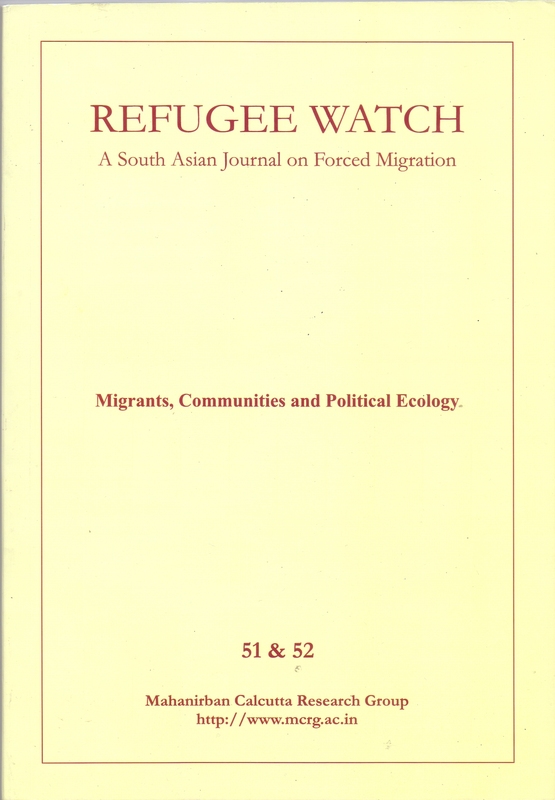 Refugee Watch: A South Asian Journal on Forced Migration is a peer-reviewed and refereed flagship journal brought out biannually by the critically recognized Mahanirban Calcutta Research Group in June and December, on a regular basis in both printed and electronic formats. It publishes original research papers that broadly engage with issues of forced displacement and migration, refugees, statelessness, internally displaced people, development related displacement, climate change and demography, borders and border conflicts, citizenship, human rights, peace and conflict resolution, women’s dignity and myriad other themes relevant to democracy. Being reviewed by an international advisory board, the journal is interdisciplinary in tenor and reflects the considerable expansion and diversification that has occurred in academia and policy -based research on issues of migration in India in recent years. The articles published are expected to initiate dialogue on the above-mentioned themes in transnational and global spaces and thus effectively open out new fields of interventions. The journal abides by international copyright rules and ethical guidelines including guidelines on originality and plagiarism, access to data, non acceptability of concurrent publication and proper acknowledgement of sources. Refugee Watch is being published since 1998 with the ISSN number 2347-405X and an index of the journal is available online. Articles submitted for consideration of publication in Refugee Watch should be around 5000 words. Book reviews can be around 1000 words and review articles can be around 2000 words. Articles will have endnotes and not foot notes. Endnotes should be restricted to the minimum. Panel discussions and round-tables can also be proposed for publication. Enquiries about possible submissions are welcome. Authors will have to submit articles both hard and soft copies (in MS Word). All articles are peer reviewed and it may take 3 to 4 months before a decision is reached on the proposed publication. Contributors will get 5 copies of the journal. Individual contributor retains her/his copyright. However, in reproduction of the article elsewhere, full citation of the journal will be appreciated. See also "Refugee Watch Online" (http://refugeewatchonline.wordpress.com) for brief news, reports, views and comments on issues of forced displacement.